Do we need a new definition of staple foods? Contemporary conceptioins of "staple" and "staple foods" misguide development policy. Staple foods are commonly thought of today in terms of providing sufficient calroies. Wikipedia defines staple foods as contributing "a major proportion of energy and nutrient needs", a mainstay of the diet; commonly consumed, year-round dietary components; and primary source of calories. Even though the Business Dictionary defines staple goods as goods that are bought often, consumed routinely, "offer little differentiation and ...usually compete on the basis of price", the definition of staple foods requires contribution of "a significant proportion of ... calorie requirements". While the United Nations Food and Agriculture Organization recognizes that food security is a complex phenomenon, ultimately the consumption portion of that phenomenon is boiled down to "sources of dietary energy supply". They also characterize staple foods as "cheap and [supplying] plenty of starch", listing five grains, five starchy tubers and one fruit (plantain) as staple foods. Following the 'food price crisis' of 2008 agriculture and food security rose to the forefront of development strategy, There is now over-emphasis on African production of staple row-crops such as maize, wheat and rice as the way to insure that the poor aren't hungry, and a commensurate underinvestment in fruit and vegetable production. The hidden fallacy is the assumption that by growing more grains and starchy foods, poor smallholders will be able to feed themselves adequately and emerge from poverty. In reality, history shows that the most of the poor emerge from poverty by engaging in market processes, specializing production, and purchasing much of their food. Indeed, most of the smallholders in Africa are already net purchasers of food. History further shows that as incomes increase from poverty level to middle-income and above, staple foods play a smaller role in the diet and nutritional adequacy becomes more important than caloric intake. The solution to the over-emphasis comes from examination of the historical definitions of staple foods. Early definitions of staple commodities were concerned with the role of the commodity in the marketplace. Samuel Johnson's 1755 Dictionary of the English Language defines staple as "established in commerce" and "settled in commerce", with the sole commodity example being wool and with connotations of quality standards. The 1828 Webster's Dictionary defines staple in part as "3. Chief; principal; regularly produced or made for market; as staple commodities". In the 1913 version specific commodities were associated with US staples: "The principal commodity of traffic in a market; a principal commodity or production of a country or district; as, wheat, maize, and cotton are great staples of the United States". The 1971 version of the Oxford English dictionary defines staples as relating to primary traded commodities, but does not provide a definition of staple food. While contemporary definitions of the noun 'staple' are largely consistent with the emphasis on the economic importance of the commodity, applications of the adjective 'staple' to food result in a de-emphasis of the economics and an over-emphasis on caloric intake. The overemphasis on caloric intake is inimical to healthy diets. 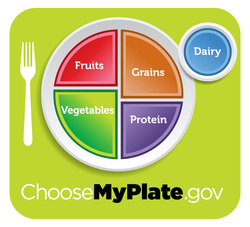 The current recommendations of the USDA include making one-half of your plate fruit and vegetables, with about 1/3 of the plate grains. Starchy vegetables include starchy roots, plaintains and whole corn, as well as some types of peas and beans, and should comprise about 1/4 of the vegetable consumption, While it is critical to a healthy diet to have caloric sufficiency, it is also critical to a healthy diet to have nutritional sufficiency. Investing in targeted fruit and vegetable production in Africa is consistent with an emphasis on staple foods, provides a way for many smallholders to generate some additional agricultural income and can improve dietary adequacy.